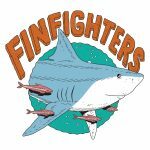 Fin Fighters are an ambitious new UK shark and marine conservation organisation; on a mission to protect sharks and end the sale and distribution of shark fin in the UK by the year 2023. We believe that people need to see that change is possible – and to see a way forward for marine conservation they feel invested in; we aim to make that happen! Through our campaigns we mobilise and empower local communities, grassroots groups and councils – creating a network that is working co-operatively to end the destruction and slaughter of shark populations through education, conservation and action.